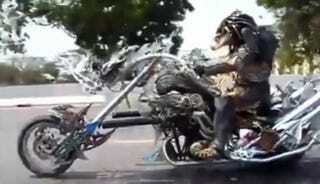 Imagine cruising down the highway, minding your own business when the alien from Predator just rockets down the highway on a mean looking moto as if it was just any other day. We're not sure what inspired this Predator super fan to storm the streets in full movie quality attire but we kind of dig it. Not everyday do you see an iconic movie villain riding around on a novelty knife shop... err... chopper. Enough talk, the video below tells all. Jokes aside, we decided to investigate the alien hunter a little and it turns out the costume is more than just for show. The wrist pad can actually start the chopper up. Watch it in action below. This post was written by the RideApart Staff.